Though some firmly deny it and others don’t dare to hope it, it’s just a matter of time. 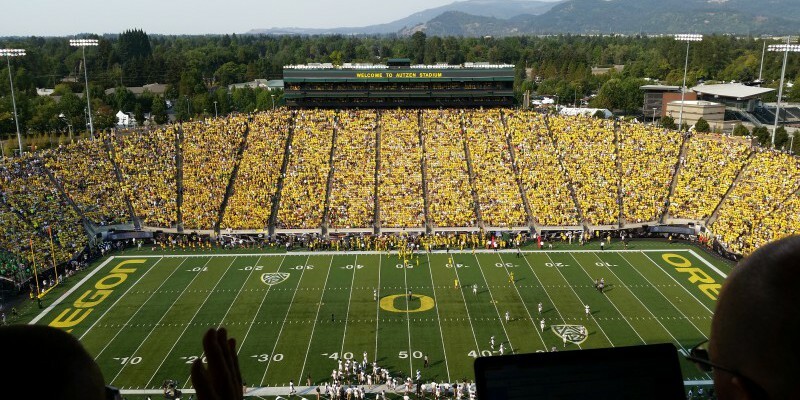 The Oregon Ducks will win a national football championship, more likely sooner than later. But first, a matter that is just a tiny bit off the subject. I received some news this weekend that can only be classified as disappointing. Not devastating… merely disappointing. My son Brian — who I put through the University of Oregon, who worked on the recruiting team that brought in Jonathan Stewart, who got help getting established after college from none other than our dearest Uncle Phil — just got a cat. What I’m about to tell you is perhaps understandable since he has since moved to (gasp) Seattle and recently married a (gasp-gasp) UW grad. She (Tam) has the good grace to at least profess to be a Ducks fan, but even still, I suppose some compromises have to come about. This is not “Steven” because they haven’t bothered to send a picture, but he’s this breed. At least his ears don’t stick up like a husky’s. Anyway, they named their cat “Steven Hauschkat” after Seahawks kicker Steven Hauschka. Granted, there’s a degree of cleverness, since it sounds a lot like ‘house cat,” but here’s the thing — the guy (kicker, not the cat) went to N.C. State. And “Steven” and my other son’s cat, Skwisgaar, are about as close to grandchildren as I will probably ever have. All things considered, the least Brian and Tam could have done was to name the cat Mrowkiss Mrowiota. They could have called him Mrow-Mrow for short and it would have brought a happy tear to my eye every time I heard it. But no. 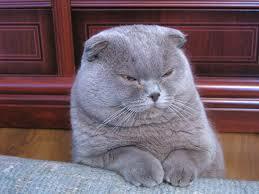 Now I have a grand-cat named “Steven.” …Named after a guy from N.C. State. And N.C. State even wears Adidas, for crying out loud. I know it’s true because I read it on the Internet. But so much for life’s disappointments and back to the subject at hand. How and why Oregon will win a national football championship is the subject of this week’s Three-and-Out. 1. Coaching. 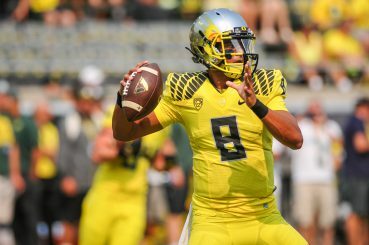 Speaking of Marcus Mariota, Oregon has a coaching staff that just produced the best quarterback in the country. The Ducks’ coaching staff has such a great track record that there’s no point even going into details. 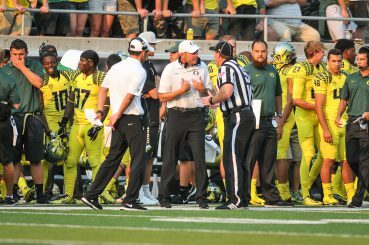 While Oregon does not have the deep tradition of the other current powers, the success is well past “flash in the pan.” The Ducks’ strategy to maintain continuity among the coaching staff and promote from within has built stability that rivals and outperforms the “traditional” powers. Further, the continuity is values-based, and this is a point that is often sold short. Emotion can win here and there, but in the long haul, focus, character and work ethic hang around and hang around, and at some point, prevail. What won’t draw so much as a one-game suspension at some programs gets athletes booted off the team at Oregon — because the coaches are willing to sacrifice short-term success for long-term growth and stability. 2. Recruiting. As discussed last week, there is some lament that Oregon doesn’t get more 5-star recruits and that, overall, its recruiting classes tend to come in outside the top ten. While the Ducks’ coaches would no doubt like to have their choice of the 5-stars, being honest with the recruits and coming to mutual agreement about fitting into the system are simply more important. Curiously, only Oregon and Stanford — two second tier teams when it comes to recruiting ratings — have ever won a Pac-12 Championship Game. And both recruit based upon recruits’ character. Mariota mocked the meaning of stars coming out of high school and deserves to have cats named after him. Oregon’s recruiting focus is sneaky good at identifying opportunities for team growth and getting the individuals who will help round out the team while fitting in. 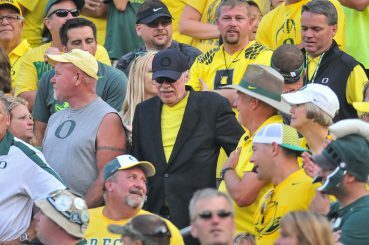 It wasn’t that long ago that the big question was, “Where’s the beef?” And Oregon has been bitten here and there by failing to win a game in the trenches. The response: While still not garnering top ten recruiting classes, the Ducks have begun building up the beef in the trenches to go with the speed out wide and in the backfield. On the offensive line, recruits 6’6″-298 Shane Limieux and 6’3″-327 Zach Okum will join freshmen 6’6″-320 Braden Eggert and 6’5″-310 Tyrell Crosby and sophomores 6’2″-305 Doug Brenner and 6’4″-300 Matthew McFadden, among other returners. On the defensive side, the Ducks added 6’3″-290 tackle Rex Manu and 5-star 6’7″ end Canton Kaumatule. Throw in the speed and talent at the other positions, and while the Ducks didn’t land a top ten recruiting class when you add up all the points for stars, they did land a recruiting class that fits the team’s needs very nicely. And this, along with the character of the recruits, is more important than the number of stars achieved in high school. 3. Energy, Synergy and Momentum. Again it was only a year or two ago that the question raged, “Is Oregon elite?” Obviously “elite” is always going to be somewhat subjective. So, if someone’s definition of “elite” includes the requirement of a past national championship, then of course Oregon is not elite. But those who skew the definition to exclude the Ducks are fooling only themselves. The best record in I-A football over the past five years is (present tense) simply more elite than a share of a theoretical national championship thirty or so years ago (yesterday’s news). A fan who would never name his cat after a former Adidas-wearing NC State kicker shows his support for the Ducks. As mentioned above, Oregon has been at too high of a level for too long to bear the label of flash-in-the-pan. The program is solid at all levels — coaching, recruiting, fan base, stadium atmosphere, national brand marketing… you name it. And there is zero in the foreseeable future to suggest that any of that is about to change. It has now been all of two days since somebody said to me, “Too bad about the Ducks.” The loss at the national championship level was an emotional setback, no doubt about it, but as Jameis Winston would say, “Get real with yourselfs.” In the past five years, no fan base has had to deal with losses less frequently than the Ducks’ — and the future is bright. It’s not as though it was the Ducks’ last chance. And it’s not as though your kid just named your grand-cat after some kicker from N.C. State. Somebody — anybody — please tell me you will name your first-born cat Mrowkiss Mrowiota.